Previous papers discussed the existence of an excess current of protons in the solar wind. This excess current of positive charge leaves the sun with a net negative charge, forming a capacitor between the sun and rings which have been detected orbiting the sun, analogous to the rings of Saturn. The physics of the solar/saturnian systems and their capacitors are described in detail in the previously published series of papers. The solar capacitor can be discharged when an asteroidal body enters the region between rings or between a ring and the sun. The visual portion of this discharge is commonly referred to as a "comet." The majority of activity In the cometary discharge, however, is not visible to the naked eye or telescope. The earlier papers developed concepts which could be derived using Celestial Mechanics, Electromagnetic Theory, plasma physics and available space probe data. From the Initial look at detail recently obtained by the Goddard Space Flight Center's ISEE-3 satellite at comet Giacobini-Zinner, a more complete picture of the internal activity of the cometary discharge has been evaluated. This refined understanding of the small cometary discharge is the topic of the present paper. The dynamics of larger more energetic comets are treated in other papers. Previous papers (McCanney, 1981, 1983, 1964, 1995) must be read with their references and footnotes to put the present paper, into perspective. 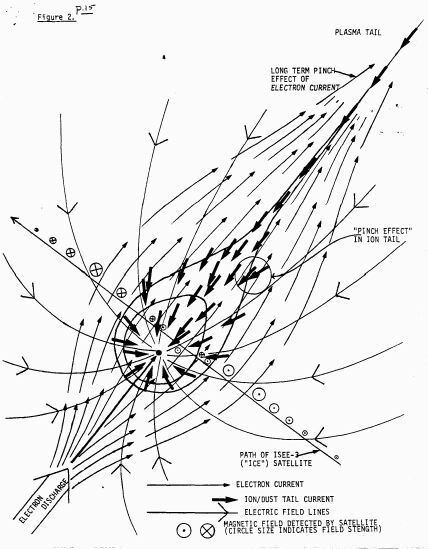 Primary results concerning the discharge of the solar capacitor Included the following: 1) electrons, due to their higher mobility, are the primary charge carriers in a discharge; 2) these are collected by the asteroidal obstruction, causing a build-up of negative charge on the comet nucleus; 3) positively ionized atoms, molecules and dust particles form the plasma tail and are attracted towards the comet nucleus. They are not melting away as specified in the ice ball comet model ; and 4) the comet tail shape is formed as ions and dust particles stream into the comet nucleus, following the electric field Iines of the negatively charged sun and comet nucleus. The myriad of effects observable in comets are readily explained in terms of this model. 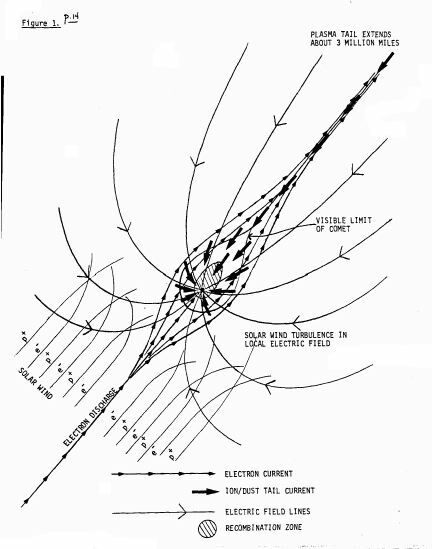 Once the physics of the solar capacitor and its discharge were understood, a limitation to further understanding and theoretical work was the lack of close range information on: 1) the extent of the local electrical field of the comet nucleus, 2) the current levels which are passed in the cometary discharge, 3) the dynamics of electron flow around the nucleus, etc. The details of this are best given as explanations of Figures 1 and 2. Figure 1 shows the overall cometary discharge, and the interaction of the solar wind with the local electric field. Figure 2 details what the ISEE-3 satellite experienced during its transit of comet Giacobini-Zinner. It is Figure 2 that should be examined closely In light of available data. Figure 1 illustrates the overall discharge of a small comet such as Giacobini-Zinner. The visible limit of the dust tail Is labeled. The electric field extends about 160,000 km from the nucleus in the lateral direction (i.e., perpendicular to the discharge). The plasma tail and electron discharge (sunward side) extend out of the diagram. Solar wind electrons and protons encounter the comet's local electric field, creating a turbulent zone in which electrons are forced outward and away from the negatively charged comet nucleus while protons are drawn inwards as they pass by the comet. A secondary effect is that this separation of solar wind plasma creates a dielectric effect reducing the extent of the comet's local electric field (i.e., it forms a space charge sheath). This will fluctuate somewhat due to the dynamic nature of the cometary discharge and solar wind plasma, but can be viewed as a steady state system for simplicity in this paper. The collision of the solar wind with the comet's local electric field will create a chaotic sort of "bow shock", but will be unlike those encounters near planets with substantial magnetic fields. The solar wind also passes perpendicularly to the magnetic field of the cometary discharge, but the magnetic field is due to an electrical discharge. Its geometry is quite different from the dipole type commonly seen around the planets. A "recombination zone" exists within the coma where electrons and ion/dust particles combine, forming a "dust storm" of slow moving particles which eventually settle onto the comet nucleus. This area is also being bombarded by electrons (from the cometary discharge) and protons (from the solar wind). So both "cool" and hot (high energy) phenomena are detected In this region. Part of the electron discharge impinges an the region around the comet nucleus, supplying it with the negative charge which creates the cometary electric field. The remaining current in the electron discharge fans around the comet nucleus as is apparent from the Giacobini-Zinner data. Figure 2 provides a close up view of what a space craft encounters as it passes through a small comet as occurred with ISEE-3 at comet Giacobini-Zinner. It is this diagram which will convince those with access to the comet probe data that comets are the observable effects of an energetic discharge of the solar capacitor. The best way to describe this is by the sequence of real time events which were encountered by the ISEE-3 satellite. Following the space craft's path as shown In Figure 2, the first detectable signature of the comet is a chaotic movement of solar wind protons and electrons as they encounter the local electric field. As the satellite approaches the comet, the magnetic field caused by the current in the discharge rises with its direction as indicated in Figure 2. A secondary effect of the solar wind turbulence region is that a space charge sheath forms, limiting the extent of the local electric and magnetic fields. Space craft antennae begin to detect signatures of energetic electrons moving upstream in the cometary discharge. The probe enters the region where electron plasma detectors record high energy electrons moving upstream (away from the sun). The magnetic field strength at this point can be used to directly calculate the current in the overall discharge. Electron counts and energies increase as the craft passes through this region. Note that electron energies provide useful information related to the potential differences in the solar capacitor. If it were known, for example, that the electron discharge extended from the solar corona (a good source of free electrons), then electron energies measured at a given point in the discharge would give the electrical potential of that point in space relative to the sun. In the interior of the electron current sheet, the space craft magnetometer detects rapidly building, fine structure in the local magnetic field. Electron currents form filaments which combine by the "pinch effect" (Rietz and Milford, 1967; Bennet, 1934; Tonks, 1939; Rosenbluth, 1957, "Dynamics of a pinched gas"). Pinch instabilities occur as the induced magnetic field pulls a filament together, causing it to quickly collapse on itself. The pinch condition is unstable and "snaps" up the filament, as is commonly observed in any high current discharge (i.e., arcing around electrostatic generators). The probe then enters the visible comet tail area. Figure 2 shows the pinch effect occurring in tail ion currents flowing into the comet nucleus. The pinch effect does not occur unless substantial currents are involved (i.e., the dirty snowball model, with its diffuse low energy cloud of ions dispersing in the solar wind plasma, cannot justify an explanation based on the pinch effect). Although the general flow of tail material is towards the comet nucleus, a complication arises from the fact that the satellite probe itself will interact with upstream electrons as does the comet nucleus (gaining a net negative charge for the same reason as the comet nucleus). Similar effects have been detected and noted by investigators studying plasma energies near the earth (DeForest, 1972) and Saturn (Filius et.al., 1980). So tail ions are detected arriving from the sunward direction, just as Figure 2 illustrates ion movement on the sunward side. Dust particles are affected less by the local electric field of the satellite because their charge to mass ratios are much lower. The probe next passes into the recombination zone where tail tons and ionized dust particles recombine with bulk free electrons forming a "dust storm" which eventually layers onto the comet nucleus. The fact that water and CO+ ions were detected was anticipated from earth based observations. Ice ball comet theorists may claim this supports the dirty snowball model, however, this is but one similarity between that theory and observation. Since both theories predict this, it cannot be used to prove or disprove either theory. The majority of observations, including the richness of high energy phenomena, were not anticipated by the ice ball comet model. This was specifically predicted in the previous papers dealing with the solar capacitor discharge model. The presence of an element In the tail implies this element's presence in the solar rings which provide the source of comet tail material. Since water was determined to be a principle element in Saturn's rings, it is not surprising that it is also present in the sun's rings. To say simply that water is seen as the primary constituent in cometary tails ignores the volumes of literature on spectroscopy of comets. Sometimes sulphur is prominent whereas heavy elements become evident in comets that pass near the sun. One of the difficulties with the ice ball model has been in explaining these patterns. The solar capacitor discharge concept explains that the tail composition depends on the source comet tail material, and therefore depends the location of the comet within the ring structures which surround the sun. At this point in the satellite's passage, the magnetic field falls to zero, as it then passes the midpoint of the entire electrical discharge. The departure from the comet, apart from an asymmetry in tail dimensions, is said to be a mirror image of the entry. Figure 2 shows that the direction of magnetic field is now In the opposite direction as it was during the entry. It is not draped down the tail, however, it is into the page, perpendicular to direction of total current. A closer look at the dynamics of a small comet has been presented, based on the solar capacitor discharge model of comet behavior and new insights gained from the Giacobini-Zinner fly-by of 1985. This work refers to previously published papers which developed details on the dynamics of the capacitors around the sun and Saturn. Bennet, W.: 1934, Phys. Rev. 45, 890. DeForest, S. E. 1972, J. Geophys. Res. 77, 651. Filius, W., et.al. : 1980, Science 207, 428. McCanney, J. M.: 1981, The Moon and the Planets 24, 349-53. McCanney, J. M.: 1983, KRONOS IX-1, 17-39. McCanney, J. M.: 1984, KRONOS IX-3, 60-85. McCanney, J. M.: 1985, KRONOS, X-2, 42-53. Rietz and Milford: 1967, Foundations of Electromagnetic Theory, 281. Rosenbluth, M.: 1957, Landshoff (ed. ), Magnetohydrodynamics, "Dynamics of a Pinched Gas". Tonks, L.- 1939, Phys, Rev. 56, 369.